Quote: “מים החלו לצאת שוב מאבני הכותל לאחר 48 שעות מהפעם הראשונה , זרימה של מים נוספים שיוצאים ממש בשעה זו , בפעם הראשונה זרמו המים כמו נביאה במשך שעה מאבני הכותל המערבי יותר מ 100 ליטר , ( הארכה שהמים יוצאים מתוך שטח הר הבית , הערכה או שזה צינור מים , או בור מים שנמצא מאחורי האבנים בתוך שטח ההר , או במקרה הטוב שהמים יוצאים מאבן השתיה , כרגע אין מידע שזה מפיצוץ צינור , במשך 40 שעות האבנים היו יבשים ללא נזילות מים , וכרגע שוב החלה זרימה , מיקום יציאת המים מתחת שער הכניסה להר הבית בשלשלת. Quote: “Water began to flow again from the stones of the Kotel after 48 hours from the first time, the flow of additional water coming out right at this time, in the first time water flowed like a prophet (?) for an hour from the stones of the Western Wall over 100 litres (extending the water coming out of the Temple Mount area, assessment - is it pipe water, or a well behind the stones inside the mount, or at best the water out of stone drinking, at the moment there is no information that it is a burst pipe, for 40 hours the stones were dry with no water leaks, and at this moment has begun to flow again. 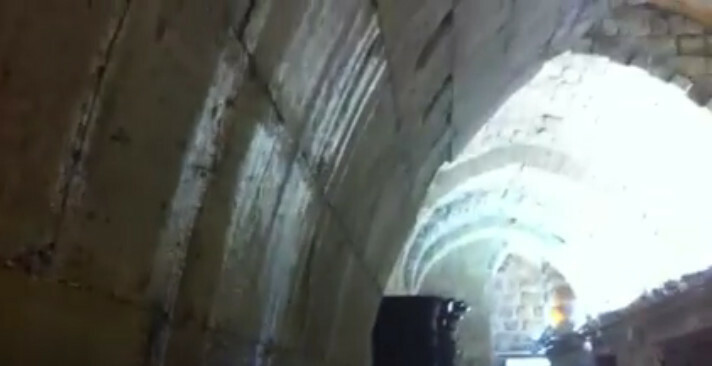 The location of the flowing water is beneath the third entrance to the Temple Mount. In the last few weeks, Israel has experienced some of the heaviest rains of recent times, with storms cutting power to tens of thousands of homes over a four day period. Central villages saw a month's worth of rain fall in just a few hours, and hailstones the size of golf balls fell on several cities causing widespread damage to property and people. It could be possible that recent rains have flooded underground reservoirs beneath the Temple Mount, and that this water has found a drainage outlet in the walls. There are also natural underground springs in Jerusalem, which could be another possible source for this phenomenon. I do remember hearing about a church in Jerusalem whose basement repeatedly floods and needs to be drained on a regular basis because of a natural spring. This news is very interesting. There is a remarkable prophecy in the book of Ezekiel which states that one day, a stream of living water will flow out from beneath the foundation of a rebuilt Temple in Jerusalem. This stream of living water will flow eastward toward the Dead Sea (Ezekiel 47), and westward toward the Mediterranean Sea (Zechariah 14:8), and as a result of these waters, the Dead Sea will be healed from its saltiness and will become a place for fishers to spread their nets. The Bible says that this miracle will take place when the Messiah comes. Over the past number of years I have commented about various man-made efforts to try and resolve the issue of the Dead Sea. The Dead Sea is drying up fast and the Israeli government have attempted various ways to try and save it. At one time they were planning to build a canal from the Mediterranean to the Dead Sea, but before the project could get underway, the economy collapsed and the project was shelved. Recently the Israeli government signed a deal with Jordan and the Palestinian Authority to build a pipeline between the Dead Sea and the Red Sea. But I believe that this too will fail, because the Bible states that it is the Messiah who will accomplish this. The Dead Sea area, once a fertile region comparable to the Garden of Eden (Genesis 13:10), was placed under a curse following the destruction of Sodom and Gomorrah (Deuteronomy 29:23). Only the Lord Himself can lift that curse, and He will lift it in His time. There is a greater curse that affects you and me today. It is the curse that was placed on us a result of our sin. The Bible says that the soul that sins must die (Ezekiel 18:4). God's perfect justice demands that all sin be dealt with, and the punishment for our sin is eternal separation from God. When the first man sinned, he automatically took that curse upon himself, and consequently upon the entire human race. But God loves us so much, He did not want us to be eternally separated from Himself. He devised a way whereby His perfect justice could be satisfied, and the curse that was placed upon us be lifted. He did that through sending the Messiah, His only Son Jesus Christ, into this world to bear the punishment for our sins. The Bible says of Him in Galatians 3:13, “Christ hath redeemed us from the curse of the law, being made a curse for us: for it is written, Cursed is every one that hangeth on a tree:”. He bore the penalty for our sins when He died upon the tree. He lifted the curse and set us free. And all who believe on Him for salvation can know their sins forgiven and have everlasting life. Jesus Christ is coming again. All the signs are pointing to it. Believe on the Lord Jesus Christ for salvation today!